KANSAS CITY, Mo. -- The battle of the league's No. 1 scoring offense and the No. 1 defense fizzled at Arrowhead Stadium Sunday with the 5-0 Chiefs rolling to a 30-14 win over the Jacksonville Jaguars, but the win may come at a cost for Kansas City, who lost four players to injuries in the contest. For head coach Andy Reid, the win proved his team can take a punch from one of the most aggressive teams in the league. "This is a good football team that was in here," Reid said. "And there's a chance you meet them down the road. They're physical, they're emotional, they're going to come after you, they're going to let you know that they're out there verbally and physically." The other story for the Chiefs coming out of the game was injuries. Starting right guard Laurent Duvernay-Tardif suffered a fractured fibula and is expected to miss several weeks. Reid indicated, however, the club doesn't consider the injury season-ending. Linebacker Justin Houston (hamstring) and safeties Eric Murray (ankle) and Armani Watts (groin) also exited the game with injuries. The Chiefs made a concentrated effort to add toughness to their defense in the offseason, and this marked the first time that new attitude showed after four uneven performances starting the season. The defense picked off Jaguars quarterback Blake Bortles four times and forced a fumble while breaking up 12 passes. "We had turnovers and the game got out of hand," Jaguars head coach Doug Marrone said. Bortles found himself under duress much of the afternoon as five different Chiefs picked up sacks. The Chiefs delivered 12 other hits on Bortles. "You can't turn the ball over," said Bortles, who finished the game 33-of-61 passing for 430 yards and a touchdown. "I can't throw four picks. It's hard to win when you turn the ball over." The toughness the Chiefs strived for manifested itself on offense as well. 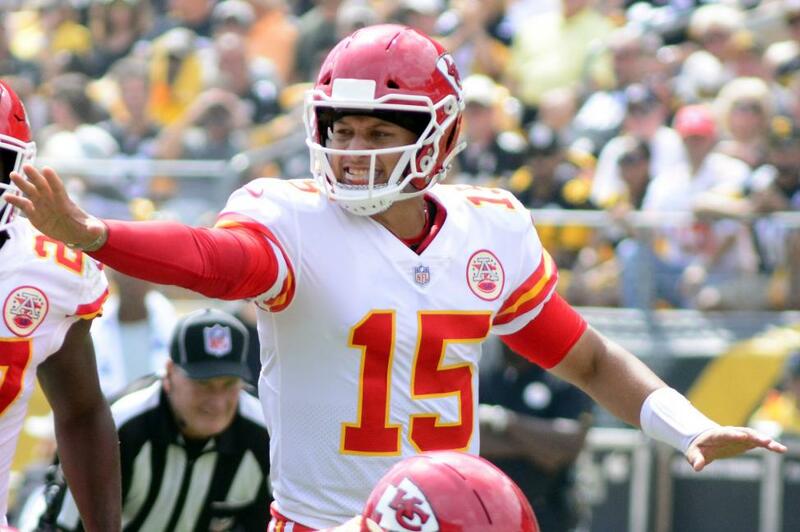 Quarterback Patrick Mahomes, who entered the week leading the league with 14 touchdown passes, tossed two interceptions with no scores while completing 22-of-38 passes for 313 yards. The turnovers marked the first interceptions on the season for the quarterback. Reid thought Mahomes answered the question of how he might handle adversity after ripping through the league during the first four games of the season. "It didn't even faze him, man, he just kept going and kept firing, made some big plays," Reid said. "You're going to throw those when you're a quarterback in the National Football League. How you react to it becomes very important, and I thought he handled that well." But the defense, unlike recent games, stepped up to bail out the offense when needed. Linebacker Terrance Smith picked up one of the team's five sacks, the first of his three-year career. "It felt pretty good when you see your hard work pay off," Smith said. "This is what we love to do, make plays in the game. That's why we're here, and it's always a good feeling." Reid gave credit to defensive coordinator Bob Sutton for building an effective game plan against the Jaguars. "I thought there was a great game plan," Reid said. "Guys executed, drove on the ball and had pressure on the quarterback for what seemed like the entire time." The Chiefs' defense allowed an average of 28.8 points through the first four games of the season, struggling at times to deliver consistent performances. Cornerback Kendall Fuller said he felt this effort coming during the team's recent practices. "The main thing was really our energy, how we were flying around, having fun, making plays," Fuller said. "I think it was definitely coming." Linebacker Reggie Ragland said the defense needed to grow up. Safety Jordan Lucas, who picked off a Bortles pass filling in after the injuries to Murray and Watts, said they accomplished that goal Sunday. "It was time for us to grow up and we accepted the challenge," Lucas said.